You wouldn't go to a Gallagher show without a poncho, so why leave your gear unprotected? Save your gadgets from electrical spikes with an incredible 2160 Joules of fireproof protection, plus gain outlet capacity with the ECHOGEAR rotating-plug surge protector. We'll make the first MOV. Fireproof MOV technology ensures your house won't burn down in the event of a catastrophic strike. Cheap surge protectors can put your home at risk. Power all the things! Featuring 8 AC plugs, you can protect and power up to 8 devices at a time. The 6 rotating plugs help control cables. Get extra peace of mind with 3 lines of voltage protection, guaranteeing your electronics and appliances stay safe. Cheap surge protectors only have one line of protection. According to our expert analysis, that's weak sauce. You probably don't know it, but you have dirty power. Other appliances in your home produce interference that can sap device life. EMI/RFI filtering keeps your power source clean, and your devices running better, longer. Built for flexibility, our surge protecting power strip has cable management hooks, and mounting keyholes so it can go anywhere you need clean, protected power. With ECHOGEAR, you also get expert customer support 7-days a week. Have any questions? Don't hesitate to contact us, we'd love to hear from you. No more wasting covered up outlets. 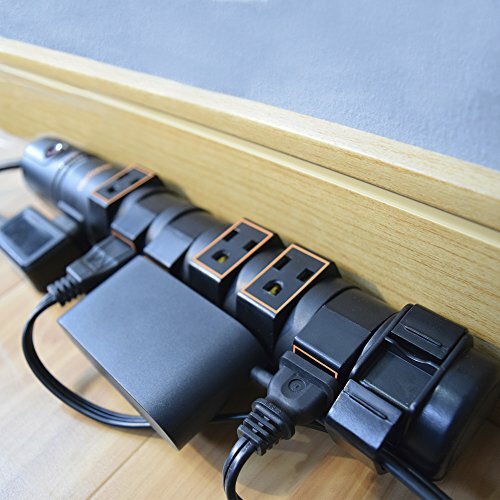 This power strip includes 6 rotating outlets that keep power adapters out of the way and two fixed side outlets for good measure. Cable management hooks keep cords aligned and easily manageable. No more untangling and fussing with any chaotic cord situations. Don't let outside electrical interference damage your devices. This surge protector filters outside interference to fuel your electronics with clean power while keeping your outlets safe. Protect your devices from electrical surges with 2160 joules of surge protection. A 2160 joule rating is top of the line and is the best option for handling multiple electronics and larger appliances. Tested and Proven to be a trusted partner. UL safety certified with a 5 year, 25k connected equipment warranty. Your electronics won't be "hertz" with ECHOGEAR. If you have any questions about this product by ECHOGEAR, contact us by completing and submitting the form below. If you are looking for a specif part number, please include it with your message.